Observation - miked's 291st spot submitted on 9th October 2009 - UK and Ireland. 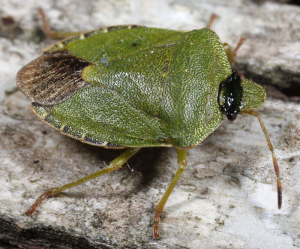 Description: Green shieldbug but what is that black stuff over the eyes? Is it a terrible disease or has it just stuck its nose in something? Green shieldbug but what is that black stuff over the eyes? Is it a terrible disease or has it just stuck its nose in something?